It’s nothing to brag about, but it’s the truth, posts at The Waiter’s Pad take me 3-5 hours to write. And it’s getting longer. My process has changed since October of 2014 and here’s the behind the scenes tour. After finishing my own book I turned to The Waiter’s Pad to see that the site needed some attention. I was posting there regularly, but my notes were lagging the episodes, and I wasn’t working through the back episodes quickly enough. One productivity tip that works well for me is to prioritize one project each day. My book being done, I make this site that project. 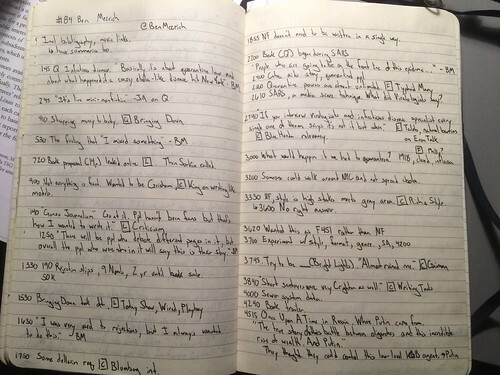 I set a goal for myself to have notes up within 48 hours of the episode’s release and so far I’ve done that. But it’s taken some work. In episode #84 Ben Mezrich talked to James Altucher for about an hour about writing, infectious diseases, and the psychology of how the media shares stories. The episode was released on a Tuesday around noon and that morning I had just finished writing the Tony Robbins post (because I also just finished reading his book). Tuesday afternoon I listened to the interview to and from getting my daughter from school and while walking my dogs at night. Wednesday morning I couldn’t sleep, and turned the episode on again at 5:30 and listened to it while taking written notes. By 6:00 the coffee and notes were done and I spent 45 minutes sketching the outline. When typing the outline I go all the way through the notes, leaving a trail of hieroglyphics to come back to. I have symbols like  which act as a checkbox, bold sections that need attention, and _____ which serves as a helipad for a name or date to land on. Below is a screenshot with some of those notes. The upper section has links that I’ve already added to book titles while the middle includes a pair of ideas that I need to find direct quotes for. This bottom section has nothing done to it yet, it’s still in the early draft form. 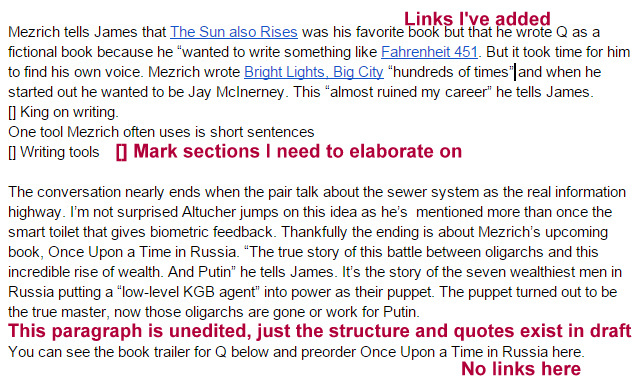 I need to add links, and the last two paragraphs were changed quite a bit before publishing. After I fill in some links and other areas it’s 8:30 and my daughters are awake. I head downstairs to feed them breakfast and we find out that school is cancelled. This means that the three hours of uninterrupted writing I typically get on Monday, Wednesday, and Friday are gone and we need to improvise. Instead, I load them up in the car and we go to the YMCA, Library, Walmart and then come home for lunch and a few chores before I’m back at the computer around 1:15 to finish the post. The last hour is filled with finding the right quote for the “ Writing tools” note you see in the image. I also omit needless words and give the post a final proofing. I know there is no time to write, only opportunities to pursue writing. If I’m truly going to be a writer that provides value I need to put in the the time. All told this post took 4.5 hours to write. This isn’t uncommon. Just a few days after the Ben Mezrich interview came out, David Levien was interviewed and the work for his post followed a similar pattern. 75 min to listen and take notes, 60 min to draft, 30 min to add links, 60 min to add direct quotes, 45 min to finalize. This entry was posted in incentives. Bookmark the permalink. I thoroughly enjoy James’ interviews, but after reading your notes with all of the extra references, I have enjoyed the series even more. Thank you for sharing your process! I am not a writer, but I loved reading about the creativity and tools involved in creating your segments. I am very glad I stumbled upon you! You have a fan. April, thanks a lot. We are in the same boat about the interviews.